Look at any advertisement for a fashion and styling store – the very prominent thing you will notice is most of the models used to promote products are teens. No argument to the fact that in Western culture fashion is an extremely essential ingredient of teenage life. Because your fashion and style speak about your personality, identity and attribute in general. The right fashion builds confidence in you. In today’s society, fashion has become a need. And it finds its presence in our lives at all times. Have you ever thought about how to come up with your own style that attracts and impresses others towards you? How can you ensure that the fashion you are following and the style you have adopted suits you the best. Each and every time you cannot be in touch with your fashion designer or boutique to verify what looks good on you and what makes you look near to horrible. To solve such never-ending dilemmas, technology has successfully entered into the fashion world by introducing various fashion and styling apps. Got nothing to wear? Unable to decide what to wear? Now you will never have this moment again with the best fashion and styling apps in your smartphone. Often, fashion for teenagers is the result of the desire to be like a celebrity. Now is the right time to style your looks and feel as if you’re a celebrity. Don’t step back in this tech-savvy era where the internet has transformed the way we use to think about the fashion. You deserve to stand out from the crowd. 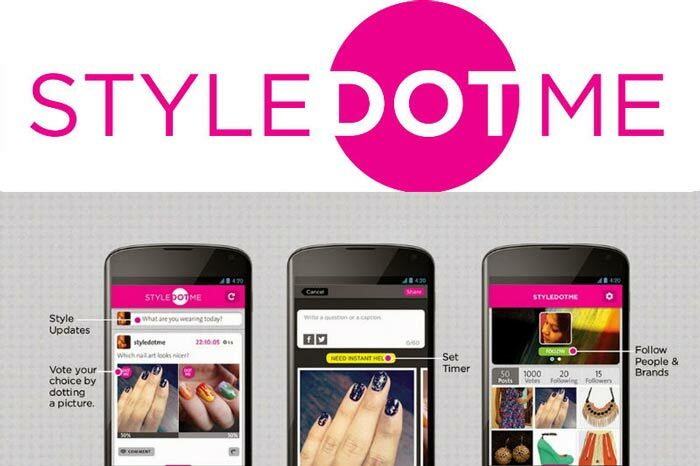 The StyleDotMe app helps you get instant fashion advice from fashion experts and other users when you are in tight corners. It helps you guide from where you can buy specific style outfit online. Every possible fashion query, around the world, is satisfied by the fashion experts at StyleDotMe, in just a few minutes. Live timer: When prompt opinions are expected in trial rooms, you can set a live timer to send SOS notification to your friends reminding them of the deadline. Instant Polls: If you get confused between two dresses, this app enables to instantly poll your friends and followers and get help to pick the smart choice. Social sharing: The posts can be shared with your friends on Facebook to get their advice, likes and comments on your daily looks as well. Follow: You can follow friends, celebrities, bloggers, brands etc. to know what’s hot in the trend. Do you love to do a makeover of your closet? Well, the exercise of taking your closet game to the next level doesn’t have to be expensive or time-consuming. This app ensures exactly that by using the proficiency that is similar to what professional stylists have been using for years. This aims to help you make the most of your closet. Mix and match is by far the most preferred style trick of teens, right? It also assists you to mix and match the outfits that flatter your body type and fit your lifestyle. Digital closet: The app organises your closet and outfits digitally on your smartphone. It removes the background of your clothes and provides you with a cleaner view to easily plan your outfits. Easy search: You can search your closet by applying a hashtag to your search term e.g. #season #colour #partywear etc. Outfit ideas: As an app user, you can send a style request whenever in dilemma what to wear. Accordingly, you can get outfit ideas based on the clothes you already have in your closet. Social sharing: You can share outfits and clothes ideas with your other teen friends via email, iMessage, Facebook or Twitter. Explore styles: You can discover new products that gel well with your existing wardrobe. Also, you can curate the style inspirations from fashionistas with a similar style and body type. As the name suggests, it allows you to “hunt” your own style. You can upload or post a snap of anything be it outfits worn by celebrities, fashion accessories, or anything similar to it. Based on what you have uploaded, The Hunt community will suggest a place from where you can buy similar items. Also, you can exchange style advice and discover new trends with people like you on the app. Start and solve hunt: Not sure what to wear or from where to buy? Upload a photo of anything you’re looking for and The Hunt community will help you find where to buy it! Alternatively, any user can use her shopping skills and suggest affordable products for the rest of the community. Share: Like how others help you style perfectly, you can help others to define their styles by giving style recommendations. Polls: Regarding the latest trends, you can raise a poll and others will weigh your style decisions. Also, you can vote to any of the polls raised by others. Browse and shop: Browse as many affordable outfits as you can and shop anything that you love or add to your wish list.